A winter photograph of Harris Armstrong's YWCA Building in Clayton, Missouri. 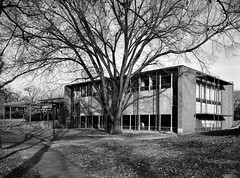 Armstrong's 1953 building for the Young Women's Christian Association in Clayton, MIssouri. The building is located at 7605 Forsyth Boulevard. The most unusual feature of the building is the use of steel bar joists in a vertical orientation on the exterior. They function as supports and bracing for the building. In particular, the overhangs at the south side of the building (right side of photograph) are supported in a lightweight fashion, allowing the maximum amount of sun to enter the building during the cold winter months when the sun is low in the sky. The other key feature of the exterior is the large tree around which the building has been sited. In winter, the lack of leaves allows sunlight to enter the building, while in the summer months the tree provides needed shade where such extensive glazing has been used.